Lost worlds, days of yore, grand ole, nostalgia are my favourite places to be, I more often than not find myself hopelessly lost in the past - not mine though, just a century or more old will do, through books and internet articles. Now for someone who clearly has no interest in the present day, coming and going fads too hold very little interest for me. Since I write a lot about food, Health fads, "healthy diets" and the latest internet super foods never fail to illict major eye rolls from me. Once such fad is that of Whole Wheat Bread and Brown Bread, I remember as a ten year old over two decades ago when whole wheat bread had just started making an appearance on bakery shelves, my mother once got us a packet and it felt like eating cardboard, it was that dry and dense. So much has changed since then, bread makers have smartened up and revamped their game, the whole wheat bread available off shelves today is as soft as white bread only that its brown in colour. The mister simply refused to accept this fact as he put two more slices in the toaster to be had with his evening tea, "No chance", I told him "that this is whole wheat, its only white bread with added molasses to change its colour to brown, not a chance that one can wolfe down so many slices of actual whole wheat bread at one go." But he brushed me off and polished off his snack. Never to let go of a brewing challenge, I whipped up a small batch of these whole wheat or atta Garlic Tea Time Buns, one small bun is all it took to fill him up nice and good. 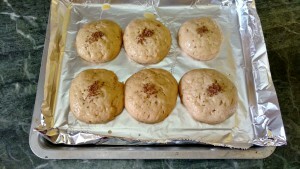 Lightly oil or pre line with baking paper a baking tray. 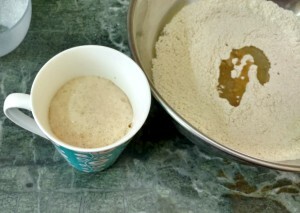 In a small container, mix the yeast, a little of the warm water and sugar and leave undisturbed until frothy. Mix in the oil after the yeast turns frothy. In a bowl, mix together the flour, garlic powder, herbs and salt. 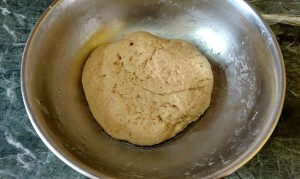 Put in the yeast mixture and the remaining warm water and mix on low speed until the dough comes together. 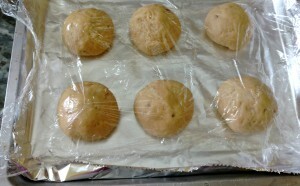 Add most of the water, reserving a little and make a soft but non sticky dough. After the dough comes together, knead it by hand for 5 to 8 minutes on a kitchen platform. 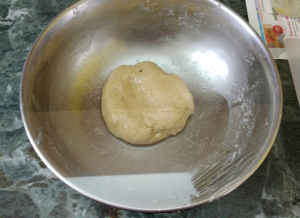 Allow the dough to rest in an oiled bowl for about an hour or until approximately double in size. Knock down the dough and divide into 18 equal sized pieces. Shape them into round balls on a floured surface with the help of your hands and arrange them on the baking sheet, keeping in mind that the balls are going to double in size. Allow the dough to rise again for 30 minutes. Brush with water using a pastry brush, sprinkle with some more mixed herbs or seeds of choice and bake in a pre heated oven at 220 degree celsius/430 degree F for about 30 to 35 minutes or until golden brown and hollow sounding when tapped.